backsplash tile - what is the backsplash tile used? Love this tile! I just bought a fixer upper condo at the beach and want this for my kitchen! Source, please?! Larson and Pratt in L.A. is where i think hey are from.. based on extensive research after not receiving an answer. Floor and Decor has plain white porcelain, and mercury mosaics has the shape but i think a tad bigger! Also stonecenter.com carries it in marble. Fish scales and scalloped are the two names i found it under. Good Luck! Please tell me the brand of range hood! - I love the round shape of this one, and it would work perfectly in y kitchen. Sorry I don’t now the brand. Also, It’s rectangular not round. what is the surface on the island counter top? Kitchen backsplash - How does the tile end on the breakfast room side of the kitchen? I love this look but my range and hood are on the breakfast room end of my kitchen and I have no idea how to end a backsplash, should I add one. Thanks! Dwell on detail. 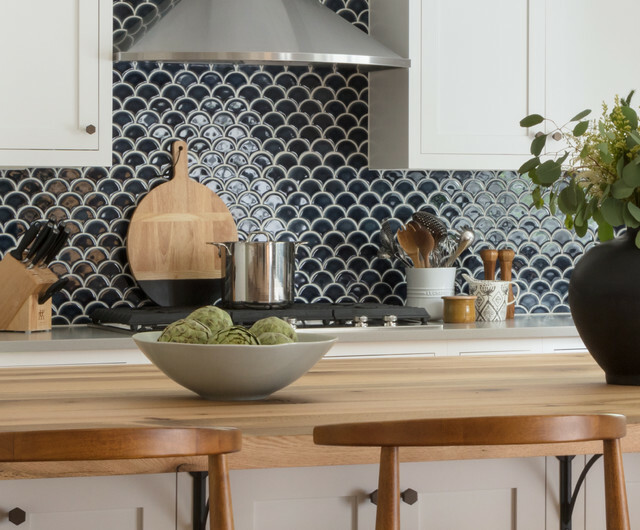 The color of fish-scale tiles you choose also can make the look more or less evocative of oceans — and what lies within them. Go for black or deep navy, as shown in this smart kitchen, and the effect is definitely on the “less” side of the equation. Using small tiles like these makes a space feel highly decorated, and even if the tiles themselves are dark, a high-gloss surface will bounce light around to keep your room bright. If looking for contrast, this is nice.